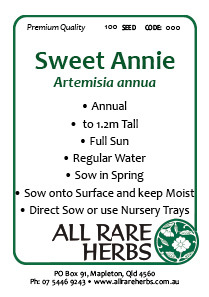 Sweet Annie seed; Sweet Annie, Artemisia annua, is sometimes known as Sweet Wormwood. A lot of interest around this herb at present. The flowering herb contains a significant anticancer and antimalarial agent. Aromatic foliage. External use of the leaves for sores and abscesses. Sweet Annie plant is native to Europe and Asia and prefers well drained soil in an open, sunny position. Frost tender but drought resistant. Annual plant, growing to 1.5m x 0.6m. Small heads of greenish yellow flowers in summer and autumn. Be the first to review “Sweet Annie, seed” Click here to cancel reply.